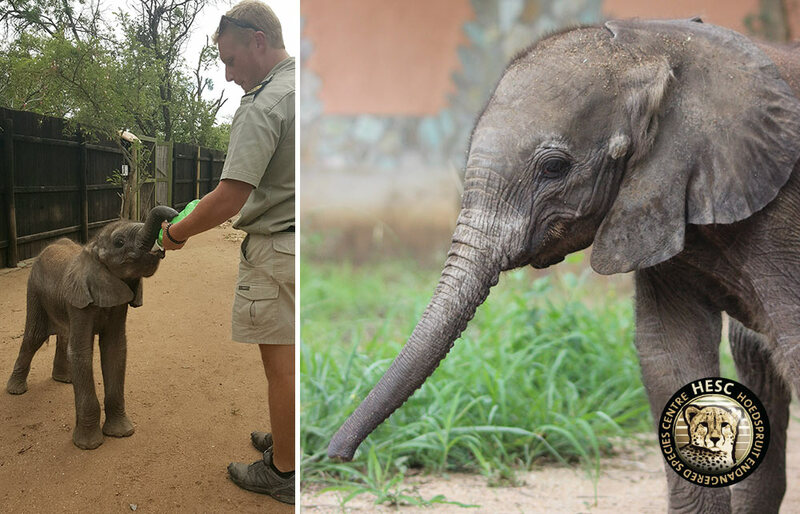 The baby elephant Mopane, arrived at the Hoedspruit Endangered Species Centre (HESC) on 8 December, 2017 – extremely dehydrated, an infected navel and a suspected sprained ankle. HESC has been ensuring round the clock care and Mopane has come a long way. Mopane weighed in at 78kg upon his arrival and has since then picked up 6 kg. He now weighs a healthier 84kgs. His navel infection has also healed but HESC is continuing to monitor it. Any slight change will ensure that Dr Rogers, the on-call veterinarian, will be contacted. It is further with great pleasure that HESC can report that Mopane’s ankle has completely healed. HESC’s baby elephant currently receives 672ml milk bottles, 10 times a day – that amounts to nearly seven liters of milk consumed per day. That is roughly 49 liters a week and 210 liters a month – the same volume as a large household geyser.